Cool FREE eastern dragons for 5e! 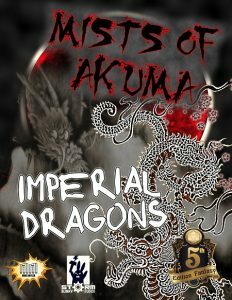 The fourth free preview-pdf for Mists of Akuma clocks in at 10 pages, 1 page front cover, 1 page editorial, 1 page list of things to expect, 1 page SRD, leaving us with 6 pages of content, one of which, as always, is devoted to the continent of Soburin, so let’s take a look! After a gorgeous art and proverb, we dive into the wonderfully crafted prose that details the history and nature of Imperial dragons – and no, they’re not conveniently color-coded. The pdf’s crunchy meat supplementing this prose would be three sample dragons – the wyrmling underworld dragon (challenge 6) that gets a nasty multiattack, necrotic breath and frightful presence. The adult variant of this dragon already has challenge 12,c an disguise itself and has legendary actions…and, at challenge 18, the ancient Hakanokishi is a pretty impressive example for the most powerful of these dragons – including legendary wing attacks. The underworld breath of the dragons gets easier to recharge at higher levels and the more powerful of these guys add exhaustion levels to the deadly breaths. Nice. Editing and formatting are top-notch, I noticed no significant glitches. Layout adheres to Mists of Akuma’s full-color two-column standard and the pdf features neat full color artworks of stock art. The pdf comes fully bookmarked for your convenience. Mike Myler’s Imperial dragons are a fun glimpse of the things to come in this regard, with particularly the fluff of these dragons being very interesting. While personally, I considered the tsukumogami more intriguing and unique than these dragons, the pdf still is FREE and a no-brainer, easy download that makes you excited about the setting – hence, my final verdict will clock in at 5 stars. You can get this nice, FREE pdf here on OBS! The KS only has 13 hours to go, so be quick or be sorry! Here’s the KS!